Our response to God’s fidelity, then, is to be faithful to Him by being steadfast in our belief and to be faithful to one another by supporting each another in the Christian life. And this faithfulness to God and to one another is described as centered in the regular "meeting together" or synaxis of the Christian community: what we call the Divine Liturgy. The sanctuary and the altar have been, throughout the spiritual development of the Church, gradually hidden and separated—not by an ecclesiastical, bureaucratic mandate—but by the Christian sense of the sacred, by a real sense of the awesomeness of the mystery of God. St. John Chrysostom and all the Fathers constantly call the altar the "terrifying table", and the mystery of the altar "terrifying mysteries," "the terrifying sacrifice of the body and blood of Christ to which we have to approach with fear and trembling." This is sacred terror and not fear of the unknown. It is a mystic trembling in the presence of heaven: "Take off your shoes," said God, "for the place where you stand is holy" (cf Exodus 3:5). From the material offerings of bread and wine of the faithful, the deacons—and, later in history, the priests—selected what was necessary for the sacrifice and used the rest for their subsistence or the subsistence of the poor. The simple ceremony of offering, receiving, selecting and distributing the bread and wine, which is the human part of the covenant, was made at a special place called prothesis or proskomedia (table of oblation). This ceremony became more elaborate later and developed into a short story and a condensed drama of the whole eucharistic sacrifice. "Blessed is the Kingdom of the Father and of the Son and of the Holy Spirit…"
When Christ ascended the cross, He succeeded in spreading over the whole world more of Himself, more of love and salvation than there will ever be of death, hatred, self-centeredness and sin. The mercy of God is the life-giving perpetuation of the divine energy of the Redeemer’s love, an outpouring of love and goodness that sanctifies and divinizes. The mercy of God is not a condescension, a paternalism on the part of God, a "crumb that falls form the Master’s table." The mercy of God is God Himself in His transforming presence. It is He, the Bread broken for all, generously given and completely surrendered. The cry of "Lord, have mercy," therefore, invokes the divine presence on the whole of creation, upon mankind and matter, upon the whole world thought of as gathered in the one embrace of Christ. Many are the needs. Many, therefore, are the cries for mercy. The rhythm of the intentions and the repetition of the "Lord, have mercy" is the manifestation of the all-embracing concern of Christ and of the Christian’s heart. It teaches the individual and the community their true relation with the world and with all mankind as it makes them go beyond themselves to embrace the whole world, all mankind and every circumstance, and carry them in their prayer and in their daily life. This litany of intentions is the vibrant acclamation of the Christian that everything and everyone belongs to God’s kingdom, where saint and sinner, believer and unbeliever are at home, and where all share in the peace of God. It proclaims the universality of the embrace of Christ which the Christian makes his own. The praying Christian realizes here that he is the brother of all and responsible for all. This is the kingdom of God! equal in glory with the Father and the Holy Spirit: save us. After the entrance of the Gospel Book and its enthronement on the altar, the throne of God as it were, the people go on with their merry celebration of the saints or of an event in the life of Christ, remembering again a phase of the deeds and goodness of God. Christians assemble to celebrate the saints also. Heroes and benefactors of humanity, the saints have surrendered themselves to God and to their brothers and sisters. They become pure transparencies for God’s action, and thus they are to us extended radiances of the incarnation. "Holy the Immortal One:" the Holy Spirit, who is life and life-giving, whom nothing—no evil, no sin, no amount of gravity of sin—can ever kill or wipe out from the soul of the Christian. Easterners call the Gospel the second incarnation. Whereas in the first the Son of God became Son of man, in the second incarnation——in the Gospel—the Word of God became word of man. He became a Book! For this reason the Gospel is always bound in silver or gold or precious materials. He is always on our altars, as it were God on His throne. The Gospel is carried in procession, borne aloft on our heads, incensed and kissed with reverence and devotion. Saint John Chrysostom says, "When emperors of this world speak, we all shout with one voice and one heart, ‘Glory to you, lord.’ But when the Lord Jesus speaks in His Gospel, our enthusiasm grows stronger and louder and we repeat it twice, ‘Glory to You, O Lord, glory to You!’" Our enthusiasm becomes love and we repeat the cry twice, once before the proclamation of the Gospel and once when the proclamation has ended. (Liturgy of St. John Chrysostom). Christians who proclaim in the Creed their acceptance of life in God, Father-Son-Holy Spirit, enter into the realm of creation, into the Kingdom of heaven, and become ready to respond to God’s excellence and love in the accomplishment of the mysteries soon to become reality on the altar. Within the reality expressed by the Creed, we find ourselves living and moving in an infinite and unmeasured Being who is Father and tenderness, who is Son and Lover, who is Spirit and Life-giver. It is the glory of the Christian to declare that all this was planned and executed by God, not for God’s sake, but "for us men and for our salvation." We were redeemed, not because of our success or our mature years, but because of our troubles and perils and God’s greater love for us. In this we find rebirth in death, resurrection and life eternal. We are ready to go deeper into the realities of God and become "eucharistic." he breadth of perspective of the true meaning of God’s intention and of His relation to creation is present here. The Father planned from all eternity and made this world and man and placed them in space and time. The Son embodied them in His own divine person in the incarnation and saved them by His offering or sacrifice. The Holy Spirit renews this salvation and divinization by His descent at the epiclisis, just as He did by His descent at Pentecost. All these divine historical actions become actual and alive before our very eyes. The world of faith takes shape, and the eternal mystery of God becomes reality in time. that everyone who believes in Him may have eternal life. …"
‘Take, eat; this is my body which is broken for you for the remission of sins.’"
the second and glorious coming again, …"
"We offer You Your own from what is Your own, in all and for the sake of all." "We praise You, we bless You, we give thanks to You, … O our God." Until now we have marveled at the works of God and praised Him for His deeds of salvation. The Father "out of nothing brought us into being, and when we had fallen He raised us up again…" (anaphora). The Son declared matter to be His body and blood, and suffered and died and rose to make us one with Him. Now we fall on our knees, begging for the descent of the Holy Spirit: "We ask and pray and entreat: send down Your Holy Spirit upon us and upon these gifts here offered." It is another awesome and most astounding action of God for us. The Holy Spirit comes to fill us and to fill the oblations of bread and wine with His own eternal being and presence by acting personally and creatively. Bread and wine and the baptized all receive Him and are possessed by Him. The wonderful event of Pentecost is now renewed and is indeed most real! "Our God, who loves mankind, having received these gifts on His holy altar, sends down upon us His divine grace and the Holy Spirit…"
The Spirit of God "becomes closer to me than my own breath" (Gregory of Nazianzus) and "more intimate than my own intimacy" (Augustine). By this descent of the Holy Spirit upon the bread and wine, anyone eating the body or drinking the blood of Christ receives the divine uncreated energies in all their majesty and holiness. Sins are forgiven and life is given. The Trinity—Father, Son and Holy Spirit—takes hold of us, divinizing us. Theosis is realized! "The priest … takes the Bread of Life and, showing it to the people, summons those who are worthy to receive it fittingly: ‘Holy things to the holy!’ … The faithful are called ‘saints’ because of the holy thing of which they partake: because of Him whose body and blood they receive. 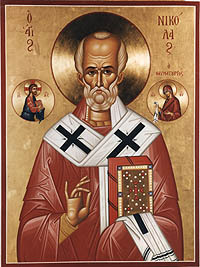 "The priest breaks the Holy Bread, saying, ‘Broken and distributed is the Lamb of God: broken and not dismembered, always eaten and never expended, but making holy those who receive it.’"
"We have seen the true Light, we have received the heavenly Spirit..."
This is life in the Holy Trinity, a perichoreisis, a dance, a playful twirl, an allegro con grazia, which whirls with the elegance of a waltz. Once the Christian has received Christ and realized the real meaning of his life, he is filled with emotion and motion and power. Even when he feels within himself a whole atmosphere of tears, he is—underneath it all—a smile. He has discovered the rhythm and movement about and within himself. He might be going through uncertainty, but he always emerges in a dazzling march towards the Light who is Christ. In Holy Communion he reaches an enthralling verve and a breathtaking, dramatic climax. These are really the heroic affirmations of the life force, which is in Christ and which from Christ flows into him. The finale for him is always the eyes of the Gospel illumined with all the glory and beauty of God, who is a never-ending feast and a supreme celebration. "The priest brings out to the people the prosphoras or altar bread from which the portions were cut out and removed, and thus is retained the great and ancient pattern of the Agape or love-feast, which was observed by the Christians of primitive times. Therefore, everyone who receives a prosphora ought to take it as bread from the feast at which Christ, the Creator of the world, has Himself spoken with His people, and one ought to consume it reverently, thinking of oneself as surrounded by all men as one’s dearest and most tender brothers. Copyright Saint Nicholas Ukrainian Catholic Mission. All rights reserved.